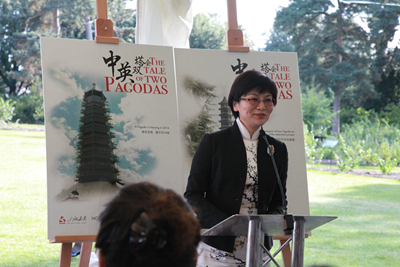 On 23 September 2016, Madam Hu Pinghua, wife of the Chinese Ambassador Liu Xiaoming, attended the signing and blessing ceremony for the Great Pagoda Restoration Project at Royal Botanic Gardens (Kew Gardens). The project is sponsored by House of Fraser under the Sanpower Group, and would be co-implemented by Historic Royal Palaces and Kew Gardens. In her speech, Madam Hu extended her congratulations on the launch of the restoration project, and expressed her appreciation for the support provided by the Sanpower Group. 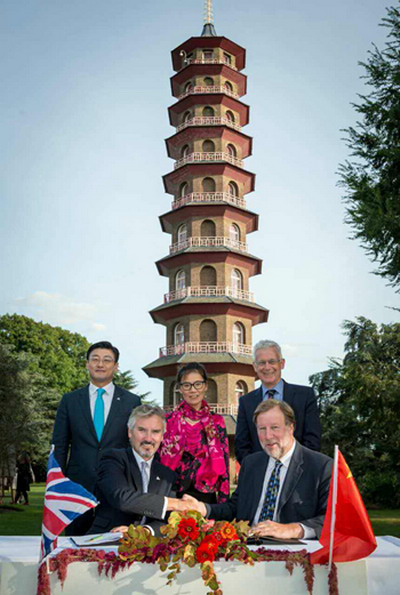 The Kew Garden's pagoda was built in 1762 based on the inspiration of Nanjing Porcelain Tower. It opens a window for British citizens to get to know Chinese culture and it has witnessed the continuous development of cultural exchanges and cooperation between China and the UK. Today, through this restoration project, China and the UK would work together to restore the Pagoda to its former glory after two and a half centuries. It offers great opportunity for British public and tourists around the world to enjoy the precious outcome of China-UK cultural exchanges and engagement. Thus the project is very meaningful. 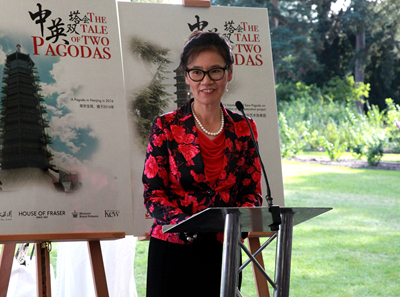 Madam Hu noted that this year marked the first year of the "Golden Era" of China-UK relations. Two weeks ago, Chinese President Xi Jinping and Prime Minister of the UK Theresa May held a successful meeting during the G20 Hangzhou Summit. Both sides reaffirmed their commitment to the Global Comprehensive Strategic Partnership for the 21st Century and their readiness to facilitate the exchanges and cooperation between the two countries in the fields of economy, trade, culture, education and youth etc. The meeting of the two leaders charted the course for the future development of China-UK relations. It would definitely further promote the people-to-people, cultural exchanges and cooperation of both countries. The Kew Garden's pagoda restoration project came at a right time. The cooperation on this project would contribute to the people-to-people and cultural exchanges and add splendor to the "Golden Era" of China-UK relations. Madam Hu expressed her hope that the project would enjoy a smooth progress and the pagoda could re-open to the public on schedule. 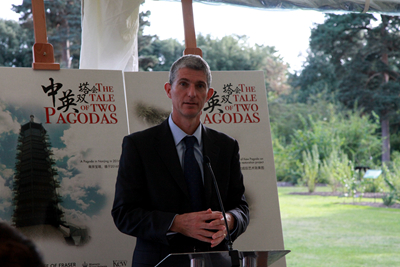 Rupert Gavin, Chair of Historic Royal Palaces, said in his speech that the Kew Garden's pagoda implies the imagination of 18th century Europe to exotic feelings, culture and spirituality of China. It symbolizes the interest and attraction between different cultures, especially between China and the UK. This cooperation, confirms what H.E. Ambassador Liu Xiaoming recently said, "throughout many years of cultural exchange, the people of China and the people of UK have all along admired and appreciated the culture and civilization of each other". Member of the Standing Committee of Nanjing Municipal Party Committee Ms. Xu Ning, who is in the UK for the "Nanjing Week" of the London Design Festival, talked about the name of Nanjing pagoda, "Baoen", which means requiting the kindness of parents as well as the universe. This value is deeply rooted in Chinese traditional culture passed from generation to generation. She believed that future visitors to the great pagoda at Kew Garden would identify with this value. When the renovated pagoda reopens to the public, it would be another good opportunity for the people of China and the UK to celebrate their passion for each other's civilization and culture and their friendship. Senior Vice President of Sanpower Group Yue Lei and Chair of House of Fraser Frank Slevin also spoke at the event. They looked back on the rare connections between House of Fraser and the great pagoda restoration project,referring to it as "destiny". They believed that the existing depth of connection between Nanjing and London would enable this project to generate greater cross-culture interest and friendship between the two cities. It would be a best interpretation of the meaning of "amity between people holds the key to sound relations between states". With joint efforts of the two sides, the pagoda project would become a much-told story and a symbol of China-UK friendly exchanges in the new period. John Pearson, Deputy Director of China Bureau of Foreign and Commonwealth Office of the UK mentioned in his remarks the close cultural communication between China and the UK and frequent exchanges at Cabinet and the various levels in recent years. There have been dialogues and cooperation in various sectors. Culture can play an importance part in the link between China and the UK. Pearson mentioned that this year marks the 400th anniversary of the passing of two literary masters, William Shakespeare and the Chinese writer Tang Xianzu and. 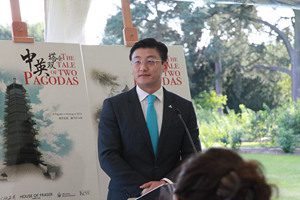 A range of commemorative activities were co-organized by China and the UK, highlighting the strong and powerful cultural link between the two countries. 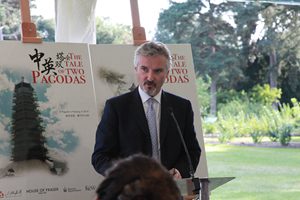 He emphasized his confidence that the pagoda restoration project at Kew Garden, based on the cultural exchanges between China and the UK, be a great success. The great pagoda at Kew Garden's was built in the 18th century. Tradition has it that the designer got his inspiration from the Porcelain Tower in Nanjing. The restoration project includes 80 dragon carvings, and the Pagoda is expected to reopen to the public in the summer of 2018. Before the signing ceremony, the organizers invited Master Dachu of Nanjing Great Baoen Temple to host a blessing ceremony for the Great Pagoda.